At Clear Spider, we are always looking for ways to give our customers more. We are thrilled to be announcing the release of the Clear Spider Kiosk. If you’ve been waiting for the complete inventory solution, this is it. Using a robust back-end and state-of-the-art hardware, it combines the best of both worlds. The built-in scanner can scan on the go and be installed as a wall-mount or as a desktop. This device is effortless, efficient, and perfect for a fast-paced environment. Highly customizable, the Clear Spider Kiosk can meet the needs of your business. Since it runs on the latest version of Clear Spider software, you can use it 24/7. So, what are the benefits and features? Using the Clear Spider kiosk, you can get real-time visibility. As your employees consume or receive an item, they simply scan the barcode. The back-end updates in real-time. Also, automatic replenishment can help you maintain inventory levels and ensure orders are not late. In addition, you can setup automatic receiving of goods coming into your storerooms. This kiosk enhances your procurement by tracking the stock levels and consumption patterns. Having real-time info lets you know exactly when items need to be restocked. Also, the system can notify your procurement professional to reorder items. This will improve productivity, as they won’t need to do a cycle count. 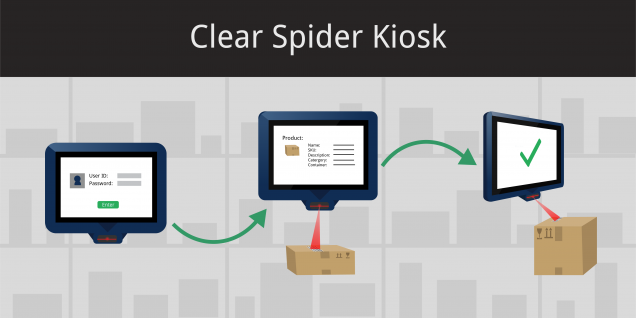 Since the Clear Spider Kiosk improves efficiency, your costs will go down. As you scan items, it can keep track of which items should be charged to which cost centers, work orders, etc. The system can also create purchase orders, reducing your reordering costs. In addition, inventory analytics ensure that you have the optimal amount of stock on hand. This can reduce carrying costs, which can make up 20-30% of the inventory cost. As a result of the kiosk, consumption will be quick and user-friendly. Employees can scan the barcode on the item and go. The system logs the transaction and tracks all changes in real-time. In addition, Clear Spider can automatically create purchase orders when inventory levels for those items approach their reorder points. When your supplier fulfills the order, simply scan the items through or auto receive them based on your supplier’s ASN (Advanced Shipping Notification). Using the kiosk, you can determine the location, quantity, and other details instantly. You can search your inventory by scanning the barcode or using search parameters. You can narrow down results by part number, group number, lot number etc. To verify the stock quantity, you can perform a cycle count with a mobile phone or a hand-held scanner. Then, you can make the required changes to your inventory levels. If needed, Clear Spider Kiosk can track the users of the device by their ID. Each user can be given an unique ID that they key in to scan and consume items. This creates accountability for the work performed. Plus, you can identify the user responsible for any action. The system also has the ability to include jobs, work orders, or cost centers for items taken. As a result, the kiosk can leave a full audit trail. If you’d like the learn more about the Clear Spider Kiosk and its features, check out our Mobile Solutions and Kiosk Page. Prev:Infographics Series: Why Choose Clear Spider?